DOHA, QATAR—U.S. Secretary of State Hillary Rodham Clinton visited Carnegie Mellon University in Qatar to hold a public question-and-answer session with an audience of students, faculty and members of Qatar's Education City community on Sunday. The event was organized and moderated by Al Jazeera in collaboration with Qatar Foundation and Carnegie Mellon Qatar. Abdulla Al Thani, the vice president of education at Qatar Foundation, introduced Secretary Clinton to an audience of 600 guests, including students invited from each university at Education City. The "Townterview," held at Carnegie Mellon Qatar, was part of Al Jazeera's Arabic series covering issues from Washington. The interactive question-and-answer session was moderated by Abderrahim Foukara, the Washington bureau chief of Al Jazeera International. "I have been following the progress of Education City from the United States, and I am delighted to be able to see with my own eyes the extraordinary commitment of the Qatar Foundation, His Highness the Emir and of the people of Qatar to the importance of education," said Secretary Clinton. She noted that with the majority of the population in the Middle East being under the age of 25, decisions that are made at Education City, in the United States, or in town hall settings are important for the future of students today in their pursuit of opportunities for peace, prosperity and opportunity. Secretary Clinton took questions from students and Education City guests on a variety of topics, including nuclear weapons in Iran; the Israeli-Palestinian situation; and her role in the implementation of President Barack Obama's agenda. She talked about the importance of education and the role it plays in providing opportunities for the youth, especially women, in the region. "Secretary Clinton understands and appreciates the mission of Education City. It's clear her visit to Carnegie Mellon Qatar is just the beginning," said Charles E. Thorpe, dean of Carnegie Mellon Qatar. "President Obama has an initiative on entrepreneurship in the Arab world; Carnegie Mellon is suited to be one of those centers. He also has extensive plans for science and technology development in the Arab world; Education City is the ideal place for that. The Secretary talked of her initiative on women in parliament. Under the guidance of Her Highness Sheikha Mozah Bint Nasser Al Missned, there is no place better than Education City to talk about empowering Arab and Muslim women. Carnegie Mellon and Education City both embody many of the ideals the Secretary talked about." 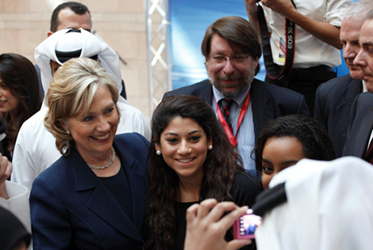 Secretary Clinton's visit to Qatar is part of U.S. efforts to boost dialogue with Muslims around the world. Secretary Clinton's core message of international collaboration and problem solving touched upon the fundamental values of Carnegie Mellon University. Pictured above is U.S. Secretary of State Hillary Rodham Clinton, Executive Vice President and Provost Mark Kamlet, Dean Chuck Thorpe and students of Education City. For a gigapan image of the event, visit http://gigapan.org/gigapans/42935/.